Use as report covers or to separate and identify other important information in your files or on your desktop. Great for use by themselves or with binding bars (sold separately). Use as report covers or to separate and identify other important information in your files or on your desktop. Clear covers only. Vinyl. For 8 1/2 x 11 materials. 100/BX. Hi, I'm Griffin at C-Line. And today we're going to talk about our clear report covers. 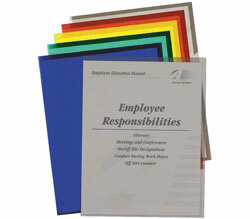 C-Line's plastic report covers store and organize paperwork and information, and the clear finish makes your presentations appear bold and bright. To use, just open the one piece folded cover and place your pages inside. Because the cover is clear, the front and back sheets remain visible so you can identify your projects quickly and easily. The cover measures approximately 9" x 11 ⅛" to easily insert and protect 8 ½" x 11" sheets. Report covers work great for separating larger files of information into smaller, more manageable sections or simply used to protect and store projects and paperwork. Use the covers alone or with C-Line binding bars or spines which are sold separately. C-Line report covers are the perfect solution for projects, reports, proposals, and more. They're great for organizing your home, school, and business. Order yours now! That's all we have for today. I'm Griffin at C-Line, thanks for watching.